MONTGOMERY, Alabama -- With 1:19 left in the game, Juan Cardenas kicked a game winning 31-yard field goal to lift Jeff Davis to a 26-21 win over their cross town rival Sidney Lanier at the Cramton Bowl Thursday night. With the game tied at 21-21 late in the game, Jeff Davis used a 65-yard drive to setup the winning field goal that started with five minutes left in the game. Jeff Davis scored again on a safety after Lanier touched the ball out of bounds at their own 4-yard line and the next play on a bad snap resulted for two more points for the Vols. "We fought to the end after being down 14 to zero," said Vols head coach Lee Carter. "We had those two early turnovers and our guys were resilient. I'm proud to be their coach. We knew we could move the ball and a great job to the offensive line and to our coaches, coach Austin and coach Chappel, they really had the O-line dialed in for this game. Our defense played well for most of the second half and this was a good team win for us." Jeff Davis (1-4) is still without their full roster due to their on field fighting with Park Crossing but should have everyone back by their next region game against Smiths Station. The two costly turnovers were on Volunteer passes. The first one was intercepted by Alazavia Berry who took it 38-yards for a Poets touchdown. With 5:10 left in the first quarter, Sidney Lanier led 7-0. On the next possession, the Vols were picked off again by a deflection that went into the arms of defensive back Jecorious Smith. With 4:15 left in the second quarter, Marquarius Moore scored on a 1-yard quarterback sneak in the end zone and the Poets took a 14-0 lead late in the first half. Jeff Davis came storming back with 2:10 left in the half and the Vols scored on a CJ Wilson 10-yard touchdown run. With the Jeff Davis touchdown, Sidney Lanier took a 14-7 halftime lead. In the second half, with 9:10 left in the third quarter Rance Lee scored on a 6-yard touchdown run and the game was tied at 14-14. With 11:54 left in the fourth quarter, Wilson scored on a 6-yard touchdown run up the middle and the Vols took a 21-14 lead. With 11:05 left in the fourth quarter, defensive back Marcus Webb recovered a Poets fumble and gave the Vols good field position. Sidney Lanier (2-3) received a break when the Poets defense stepped up and forced a three-and-out while on the punt attempt, the bad snap forced the punters knee down on the field to stop the action but setup the Lanier offense deep into Vols territory. On a long third down play, Poets quarterback Moore found Jakobe Armstrong in the middle the field that took the ball down at the 1-yard line of the Vols. Moore scored again on the 1-yard QB sneak and the game was tied at 21-21. Then with five minutes left in the game, the Vols went on their game winning drive and they get the game winning kick. "Everything was going through my mind before the kick," said the Vols kicker Cardenas. "I was really nervous but I put everything into God's hands and we came out with the victory." 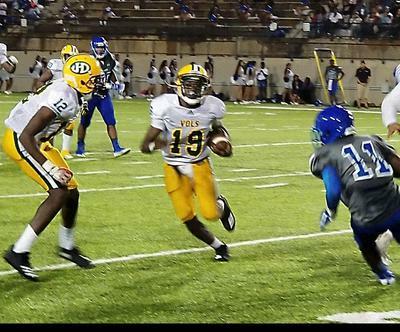 The Jeff Davis defense played really well for most of the game. "We had to play together and play really hard," said linebacker/running back Malcolm Harris. "If we play well, we will win. The offensive line did a great job of opening up holes for us running backs. We have to keep it going so we will have a chance for the playoffs." Up next for these two teams, Jeff Davis will travel to Smiths Station for a big Class 7A Region 2 game while Sidney Lanier will travel to Russell County for a Class 6A region 2 contest.